Clearly, the poor performance at the box office of this film bodes ill for any sequels. A modest hit overseas, a disaster here in the states, the film will go down as a paradigm of how not to do fantasy, even as the books which it is based on are finally revealed as poisonous vehicles of hatred. Not a good idea to dis God. The Vatican weighed in with its scathing review decrying the film as anti-Christmas and finding great consolation in the low box office revenue. See Vatican Pullman Putdown. New Line Cinema will lick its wounds for only a while. Seems like repentance will bring new blessings--see above post. *****December 11 Update--Bishops Pull Positive Review Of Movie!! 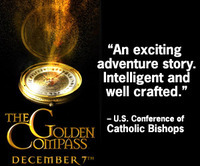 Yesterday, the Bishops pulled the positive review of The Golden Compass, see Bishop's Review. The USCCB did this without comment, but there will be a response shortly. Check out this story for more info: Call to fire reviewer. As mentioned before, this review was done in the Bishops' name and many of them are outraged about it. The conference took it on the chin this weekend as the Bishops were used as a foil to praise the movie while other Catholics vigorously opposed it. Fortunately, many Bishops and dioceses published highly critical letters and articles about the books and movie anyway. Oh, Oh! Reuters is reporting, see box office disappointment, that the first box office returns do not bode well for the movie--less than $30 million this weekend. Shucks! Guess boycotts occasionally work, though, in the end, what will sink this franchise wannabee is a wretched story and a hatred for the God who gives the ultimate happy ending--eternal life--to those who believe in him. Many thanks to William Donohue of The Catholic League for relentlessly hammering away at this travesty of a trilogy and its cinematic debut. According to an average of 146 reviews, see review compilation, the movie is averaging only a 45% favorability rating. Staggeringly poor for a film for which people had such high expectations. It will be interesting to see how that translates at the box office. *****On The Eve Of St. Nicholas--A New Update!! Time to take a look at the reviews, which are decidedly mixed on this movie. Interestingly, the negative ones primarily divide into two camps: those who find the movie simply boring and dismal, and those who are angry that the anti-Catholic tone of the books has been toned down. Check this link to get a sampling of the current reviews: Golden Compass Reviews. My hunch is that this film will be at best a moderate success because of a lack of return viewers and because, at its heart, it's just a very poor fairy tale. Great bears though--wish they had a more noble cause to fight for. In the end, a poor story told poorly. Here's a pic of New Line's advertisement for the movie, quoting the USCCB review. Earlier in the day, the citation in the ad was a cobbled together piece that erroneously quoted Forbes, making him sound worse then he already was. Unfortunately, in this corrected ad, the quote is accurate. In the reviews of the movie, reference is often made to the popularity of Pullman's His Dark Materials Trilogy. In Salon.com review, that came out today, a review written by a "Catholic" , mention is made of "Pullman's wildly successful, Whitbread and Carnegie award-winning triology." It's always called very popular, but I have to confess something. Several years ago, I made it through the first book and part of the second and then I had to quit. Not because it was anti-Catholic--I always like to know what the enemy has to say about us--but because it was amazingly boring and joyless. I have never met a child or an adult who has made it through all three books. Have you? It's on the library shelves of the public schools within my parish, but kids just don't talk about it. Methinks the trilogy's popularity is wildly exaggerated. Based on the favorable coverage given by the USCCB reviewer, New Line tried to contact diocesan media outlets to put ads for the movie in the local diocesan papers. I checked this out and have found that the dioceses' communication directors and editors across the country are very cool to this idea. Common sense seems to prevail here. Also, Bishop Listecki from LaCrosse has written a powerful letter to pastors warning of the anti-Catholic nature of the books and movie. Check it out here Bishop's Letter. And so the controversy begins. The Catholic League opposes the film, the USCCB (United States Conference of Catholic Bishops) film critic likes the film, and the San Francisco Chronicle at least has the intellectual honesty as it gives a thumbs up review to admit the film and books are anti-God, anti-Catholic, and exuberantly pagan and secular. Here's an article I did for our diocesan paper, Fantasy Gone Wrong. Here are three sites that are great at summing up the controversy in the media. Check out the USCCB review here USCCB Review, The Catholic League response here Catholic League, and the San Francisco Chronicle Review here San Francisco Chronicle. I am truly baffled by Harry Forbes' review for the USCCB. He obviously is not familiar with the books, the author's intent, and the malevolent message behind this project. There is no doubt the film will look magnificent. Mr. Forbes praises the fact that the anti-Christian elements have been toned down. I agree that it will be a pretty film that doesn't overtly bash the Church. Yet that doesn't disguise the fact of what the movie and books represent, or their danger--not to adults--but to unsuspecting kids who think they are getting an uplifting fantasy story. Dorian Gray looked great on the outside too, but inside was full of corruption. And what was it that Jesus said about the outwardly pious Pharisees? White-washed tombs he called them, but inside full of filth and dead men's bones. Sort of like this film. Very much like these books. Whoa! Armored warrior bears! How cool is that! Add flying witches and airborne schooners along with one's spirit which lives in an animal familiar that walks by your side--and....wow! You've got yourself one heck of a Christmas film. Simply beautiful to look at--sort of like the forbidden fruit on the Tree of the Knowledge of Good and Evil in the Garden of Eden. Looks great but in the end, nothing there, only despair. People are just becoming aware of the latest blockbuster from New Line Cinema, set to come out for the Christmas holidays. 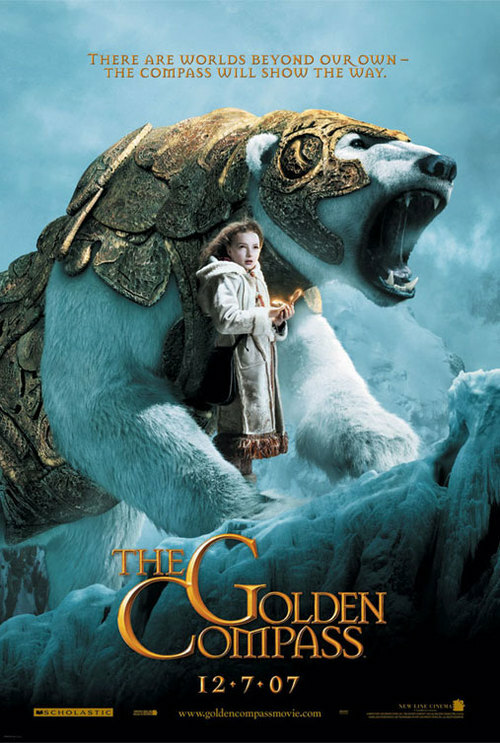 Headed by an all star cast including Nicole Kidman--who recently, she says, re-discovered her Catholic faith--The Golden Compass is the first installment in the adaptation of Phillip Pullman's His Dark Materials trilogy. New Line has sanitized the first book and removed some of the overt anti-Christian propaganda from it, yet no matter how much one sugar coats dung, it still remains offal. There has never been a more anti-Catholic/Christian fantasy than this trilogy. Pullman, an avowed atheist, hates Tolkien and Lewis' work. Even the first book, the most optimistic of the three, is rather dismal and joyless. When the main enemy is the Church (in the film, its called the Magisterium--how's that for sanitizing!) and the fantasy becomes a screed against Original Sin, God, eternal life, etc, one wonders if the fantasy has died and the veneer of a literary form is used just to push some propaganda piece of atheism. Pullman's title for his trilogy comes from John Milton's epic poem Paradise Lost, the tale of Satan's fall and temptation of humanity. Pullman thinks the wrong side won the war for heaven. In his novels, he wants the bad guys to succeed where Satan once failed. In fact, the novels incarnate the words Satan says in Milton's poem as the fallen angel shakes his fist at God. "Evil be thou my good," says Satan. A total shift of values is what Pullman is after. He's not even subtle about it, but he is insidious, for he seeks to inculcate these values through stories meant for children. And that is perverse. To take advantage of the innocent to turn them to what humanity has always labeled evil is the height, or depth, of degradation. I don't believe in boycotting films or books, but what Pullman is trying to do challenges me to make clear what the film and the books it is based on truly are: an attack on Christianity and the values Christ taught. Is this what we want our children to see and read? Let those who possess the tools to adequately evaluate Pullman's work read the books and see the film. But to my mind, kids ought to be protected from doorways that lead to darkness. Pullman opens a passageway to hell. New Line Cinema just makes it look pretty, but that doesn't change the reality. It will be interesting to see how successful the film is. The trailer seems lush and the special effects excellent, but the story seems convoluted. After one gets over the visuals, it's hard going slogging through the plot lines. Will a film based on a book that denies God and goodness as we know it really appeal to children? Doubtful. In the end, if a fantasy doesn't end happily ever after, it isn't much of a fantasy. With no God, no good, no eternal life, there can't be much of a happy ending. J.R.R. Tolkien saw the formation of good fantasy as sub-creation--humanity imitating God in trying to bring forth good through literature. Pullman only seeks to give us hell, and seems happy to bring it, making concrete the old cliche that misery truly loves company.